Hello! Hope you've all had a fun weekend. I've sadly lost my favourite day of the week to a hangover and I'm quite gutted about it. I don't feel as bad as I could have done, but it's enough that I can't fully appreciate the day - I really do like to make the most of my Sundays! 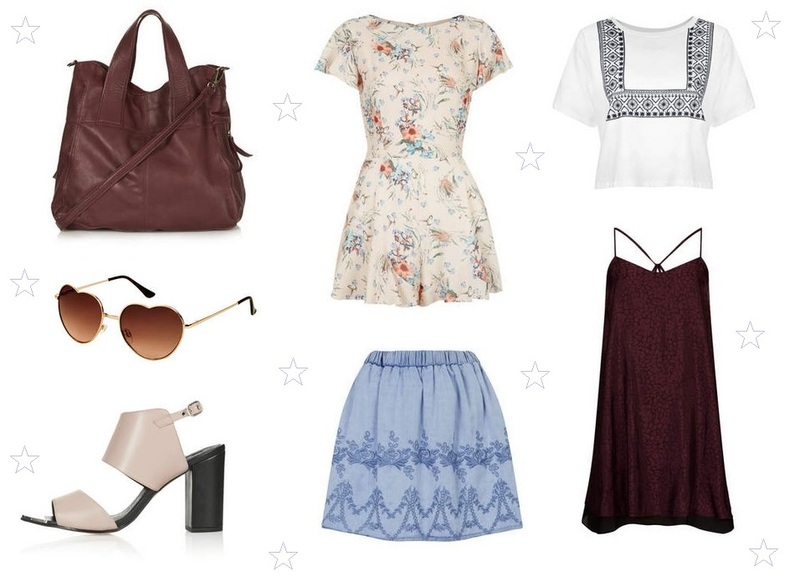 Anyway, I spent a lot of my day on the Topshop website so I thought I'd show you some of my favourites. Since it's August, I've made a wee promise to myself not to buy any more summer stuff, so the majority of these are things that are transitional for Autumn too. I'm starting to get drawn towards darker colours now, especially this gorgeous 'mulberry' shade. My favourite Autumn shade by far and luckily, it looks nice with a summer tan too. Do you like any of these? Which one's your favourite? p.s make sure you enter my giveaway! 8 comments on "The Sunday Wishlist #1: Topshop Picks "
This is such a pretty wish list, the colours are gorgeous! I love the dress and the bag. These are all great transitional pieces! So many lovely things! I love the shoes and sunglasses, the playsuit is gorgeous! I love the maroon dress. It's such a lovely colour! I love the maroon dress too! great picks!